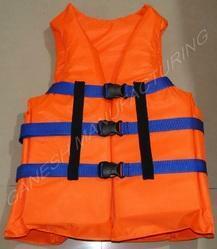 We have specialized ourselves in the fabrication of optimum quality Water Safety Equipments. These are precisely designed from optimum quality raw materials using advanced technology in different sizes. These are customized as per the specifications of our clients can be bought at the industry leading prices. 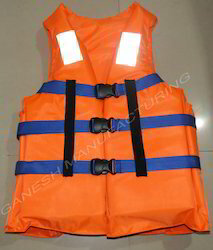 Marine Life Jacket is compact life saving devices that prevent person from drowning in the water. Made of tough and virtually water impenetrable polyethylene fabric, Ganesh life jacket supports your head above water - even in the choppiest waves. Buoyancy: The life jacket is capable of keeping afloat with load and face above water, for a minimum period of 24 hrs during continuous use. Construction Material: RIB type soft rigid PE foam 3 Layers stitched with Nylon water proof fabric. The material is light weight tough and shred & tear resistant. Robust & wide adjustable straps provided and the fasteners on the straps are of quick lock/release mechanism. The jacket can withstands prolonged immersion in fresh water & soap water absorption is negligible. Pasted & Stitched with 50 mm SOLAS reflective strip. Belt Strap: 3 No's heavy duty nylon strap with push type plastic buckles. Construction Design: The design confirms to standard sleeveless jacket with front opening. It is comfortable to wear in all weather conditions and is efficient even after prolonged usage. Retroreflective Tape: 2 No's on front side and 1 No on back side of jacket. Safety Measure: A non metallic whistle firmly secured by a nylon cord and housed in a loop on the jacket. During its services the jacket will not have any loss of buoyancy due to repeated use. Buoyant Material: Water proof Polyurethane foam. 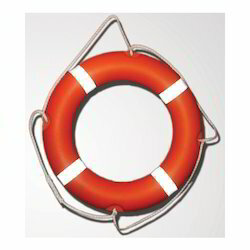 Looking for Water Safety Equipments ?